"Stargate Origins," a prequel series to MGM's "Stargate" science fiction franchise, is now streaming on the online platform Stargate Command. 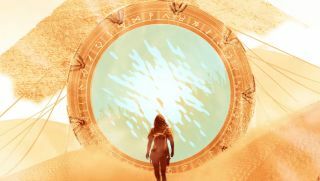 The "Stargate" prequel series "Stargate Origins" has begun; the first three episodes are now live, and additional episodes are set to release at least once per week. The episodes are available to paid subscribers now, and will be freely available starting at 7 p.m. EST today (Feb. 15), or midnight Feb. 16 GMT. The 10-minute episodes of "Stargate Origins" are available only on the streaming service Stargate Command, which also hosts all previous "Stargate" TV series and movies for viewers with paid accounts. While the first three episodes will be free to anyone who signs up for Stargate Command, future episodes will be available only to those who pay a one-time $20 fee. The episodes will be available online until May 15, Stargate Command representatives said in a statement. "In 1939, Professor Paul Langford and his daughter Catherine are still grappling with the mysteries of the ancient relic they discovered in the Egyptian desert more than 10 years ago," representatives said in the statement. "With war looming in Europe and funding running out, these brilliant minds are approaching their lowest ebb. Little do they know, answers are about to present themselves in a dangerous form, when the Nazi occultist Dr. Wilhelm Brücke approaches their facility with a sinister motive. "Enlisting the help of two young soldiers, Catherine and her new allies embark on an adventure into the unknown to rescue her father and save the Earth from an unimaginable darkness," the statement continued. Watch the first three episodes of "Stargate Origins" here.